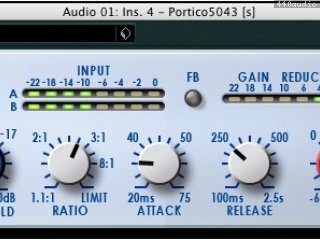 Following the hardware equivalent, the Portico 5043 houses five essential parameters: Threshold, Ratio, Attack, Release and Gain. A minimalistic approach, that allows to focus purely on the sound that needs to be processed. Thanks to VCM technology, the depth and sonic character of Rupert Neve's analog sound is directly transformed into the digital recording environment — without the need to deal with dozens of parameters to get that signature sound. The 1.1 update provides integrated Quick Control assignment and adds a sidechaining function to the 5043 Compressor.